Both campaigns expect a record-breaking turnout in Virginia, which has added more than 500,000 new voters to the rolls in the past year. The Obama campaign has worked particularly hard to try to win Virginia, which, as has often been said, has not elected a Democrat for President since Lyndon Johnson in 1964. The Democrats have had a particular focus on suburban voters, new voters and southern voters in traditionally Republican areas. They are expecting hand-to-hand, door-to-door combat. Says Jared Leopold, Virginia's communications director for the Democratic party's coordinated campaign: "We are expecting a very close election. [Democratic Senator Jim Webb] won by less than 10,000 votes across Virginia. He won by less than one-half of a percentage point. [Democratic Governor Mark Warner] won by only five points in 2001." Still, the lines for early voting were long, an ominous sign for today's vote. And the fact that people were willing to put up with it reflected voter frustration with Ohio's tanking economy. 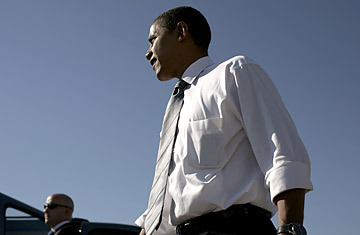 Bell Bonner, a black, 50-year-old mother, was in line to vote Monday afternoon for Democrat Barack Obama. She had her three toddler-aged children in tow and was calling up nieces and nephews, some of them first-time voters, to join her. "It's the recession," Bonner said when asked why. "It's crime in Cleveland, it's no jobs." She says, "Everybody who didn't vote last time is voting this time." Read an overview of Ohio's three main battlegrounds. Even the state's Republican governor speculated this year that a certain number of Pennsylvanians would never vote for a black president. That's the portion of the white vote Hillary Clinton once counted on to put her over the top in the primary here. Murtha's territory includes a portion of Pittsburgh's Allegheny County, though none of the city itself. Will such local voters hurt Obama today? George W. Bush clobbered John Kerry 56% to 44% in Florida's 25th congressional district in 2004. The 25th probably has more alligators than voters, since it stretches west from the southern suburbs of Miami clear across the Everglades. But if Barack Obama can win there today  and his prospects look surprisingly strong  then Florida, the nation's largest swing state, will most likely be a swamp for John McCain. Obama looks to be in a statistical dead heat with McCain in the district (just as the Democratic challenger in the 25th, Joe Garcia, is neck-and-neck with the Cuban-American GOP incumbent, Mario Diaz-Balart). The key is how many Cuban-Americans Obama can poach from the GOP; and Obama volunteer Jose Realin thinks he can deliver them. Realin, 38, a bail bondsman and a lifelong registered Republican now on the Democrat's side, was heading out of the Obama campaign office in the 25th on Monday evening to knock on doors in Cuban neighborhoods. "They worry that Obama won't be tough enough with Castro," he said, "but the economy, the war  that stuff is making them a lot more open-minded." Signs outside the campaign office weren't trumpeting the polls that showed Obama well ahead of McCain across the country. Instead, they flashed a Zogby International poll released over the weekend that has McCain with a two-point lead. It's meant to spur Obama ground workers like Realin in their unlikely effort to put the Illinois Senator over the top in a state that hasn't voted for a northern Democrat since Franklin Roosevelt in 1944.